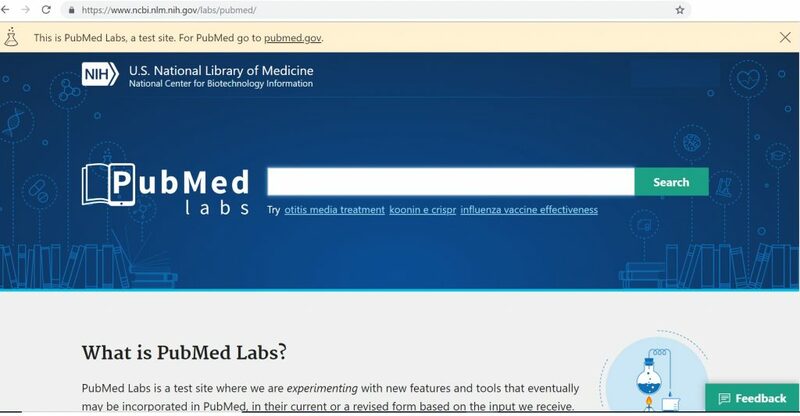 PubMed Labs is a test site where the NLM/NCBI are experimenting with new features and tools that may eventually incorporate in PubMed. They are looking for inputs on these features / tools and the final incorporation will be based on the inputs they receive – so what you see today may get included as it is, or in a revised form. What is the NCBI/NLM working at? Better search algorithms: A new search algorithm that uses machine learning to more accurately find the best matches. The “best match” option to display results already exists and is based on some algorithms, but PubMed Labs is where the search is on, to improve this. Better design – It provides better support for mobile devices with a responsive design that makes searching and reading articles easy on all devices. Showing “article snippets” – Snippets are highlights from the article abstract that are identified based on their relevance to the user query. Testing is on to see whether these highlights help users more easily find articles of interest. Remember – PubMed Labs includes only a limited set of features, (mainly the ones being experimented on) and not the full set of PubMed tools. So if you do not find something that exists in PubMed, but is missing from PubMed Labs, it does not mean that it will disappear from PubMed! Let us all look forward to a better PubMed in the times to come!